The perfect blend of lemon, blueberry, ginger, vanilla, and a hint of cinnamon, this baked oatmeal will become a family favorite! Preheat oven to 350 F. Spray a 9″ pie plate with non-stick cooking spray and set aside. 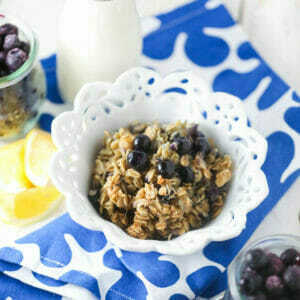 In a large bowl, combine the oats, brown sugar, cinnamon, ginger baking powder, salt, and blueberries. In a smaller bowl, whisk together the milk, butter, vanilla, eggs, and lemon zest. Add the liquid mixture to the dry mixture and stir to combine. Transfer the mixture to the prepared pie plate and bake for 40 minutes or until the top is golden brown. Serve immediately with a splash of warm milk.